Having a garden in your yard takes time, dedication, and commitment. Maintaining it green, clean, and pest free requires a lot of work and patience. It requires patience because a flower, tree, fruit, vegetable, any plant takes time to grow. One will water the lawn regularly, mow the grass every other week, trim branches once a month, yank weeds when it’s necessary, and cover bushes and gardens over the winter to have a beautiful, well preserved yard. A similar care goes for farmers. Farmers harvest fruit, vegetables and other produce that humans consume. It’s a highly important to preserve the prosperity of the farm. Garden and crop pest are a problem when they are spotted or plant damage is visible. The immediate action that a farmer and gardener is to buy pesticide and spray it anywhere and wherever it’s necessary. It most cases, when pest are detected in your lawn or farm, there is a possibility that pest have moved indoors. One might used the same outdoor pesticide indoors. The reason being is that everyone thinks all pesticides are the same. That is not true! There are different pesticides for different pest and are generated for outdoors and indoors. Pesticides is a substance that destroys insects and other organism that harm cultivated plants. Examples of pest that harm your plants are capitellars, grasshoppers, flea beetles, wireworms, stink bugs, fungal diseases, plant viruses, mice, and snakes. These are only a few examples. Not all insects, bugs, and small animals do harm to your garden or farm. Just like there are pest and other organisms that harm your plants, there are other pests and small animals that protect and take care of your plants. To get rid of pest that sabotage your plants, it not necessary to use a pesticide, there are other alternatives that should be considered. Click here to learn about a differences between insects, bugs, diseases and small animals that harm and protect your plants, and how to properly get rid of those pest that harm your plants. Once you identify what pest is destroying your plants, and your research indicates that a pesticide is the best form to kill the pest, than that’s the way to go. When purchasing a pesticide, consult the label. Make sure that the label indicates the target pest and site (indoor or outdoor). Plus, keep in mind that pesticides only control certain stages of the pest. For example the caterpillar. There are insecticides that will kill only the larval stage and not the eggs or pupae. Another example is fungus. There are fungicides that are preventive treatments, however, will not eliminate infection that has already started. It’s important to consult the label! Other information that the label can provide is how to properly use the pesticides. It will indicate how much to to use, how and when to apply, what equipment is required, precautionary statements, first aid measures, and how to properly store and dispose of the pesticide and empty containers. All of these procedures and precautions are very important. Pesticides kill pest, which suggest that it’s a form of poison and toxin. If the statements and safety measures are not being considered accordingly, it could either contaminate your plants, environment, and your health. Pesticides are toxic to living organisms. Your cultivate plants are living organism. If you apply any kind pesticide without reading the instructions, there is a high probability that your plants will be infected by the chemicals. When you inappropriately apply the pesticide (the amount, place indicated, and how), it could harm beneficial insects, soil microorganizism, and the soil’s health. In addition, the immune and plant root systems could be compromise. Another living organism is you. When reading the labels, you’ll notice the health dangers that the pesticide can cause. A few examples of the acute dangers are nerve, skin, and eye irritation and damage, as well as headaches, dizziness, and nausea. Reading the labels is important! Labels specify if the pesticide is for indoors or outdoors. Outdoor pesticide is stronger and climate control. There are pest that live indoors. Common mistakes people make is using an outdoor pesticide indoor. Indoor pesticides have concentrated chemicals. Just because an outdoor pesticide seems to be a stronger substance, it not recommended to use indoors. As mentioned before, all pesticides specifies what pest is targeted at what stage. Indoor pests are not the same pest that are inhabiting in your garden or farm. Read the label! Having a beautiful, well maintained lawn, farm and house takes a lot of hard work. And when little invaders, pest, move in, it’s irritating! In order to handle the situation well, identify the pest. Remember, most insects and small animals are beneficial for your cultivated plants. However, if it’s an invader, a pest doing harm, then research the best form of killing it or getting rid of. If a pesticide is the best form, consult the label when purchasing. Follow the instructions to the word. Not all pesticide are created the same. If you are not sure how to handle a situation like this, call us. 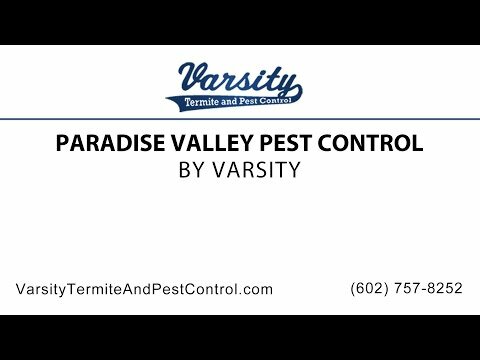 Varsity Termite and Pest Control has Paradise Valley pest control exterminators that can help you keep your garden, farm and house pest free.